What is Manitoba flour, and where can you buy that? Will normal bread flour do? Thanks. 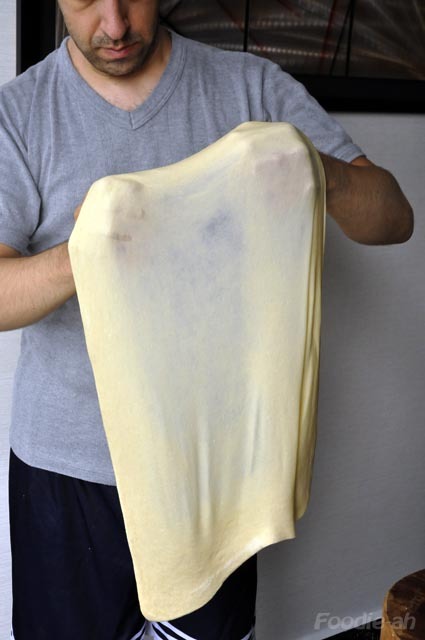 That is awesome..... Where can I get the cheese and the flour from? LT - Manitoba flout is Canadian Red SSpring wheat flour. If you are based in Singapore, you can find it in some Cold Storage. I can guarantee they sell it in the one in Tanglin Shopping Centre. The brand is Waitrose, and it is labelled as "Very strong Canadian white flour". 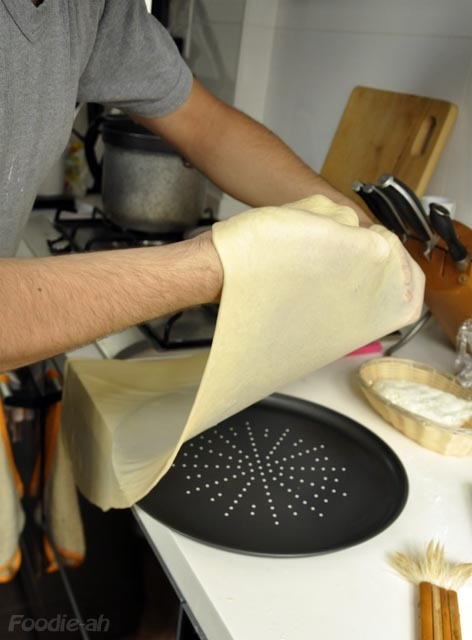 You cannot use normal flour as it won't hold the stretch. Anonymous - I bought the cheese from Giorgio Ferrari (online). The link to the website is mentioned in the post. Thanks. I had guessed it'd be Canadian flour. I checked out Giorgio Ferrari's website for the cheeses. Do they sell retail portions, or it has to be kg and cartons? Thanks for the recipe; I plan to try it. LT - You can click on "Order now" and buy online, or download the catalogue and call them for the order. Either way, they sell as little or as much as you like, the only caveat is that the delivery is $30, or for free delivery you need to spend $300. Unfortunately, crescenza is only sold by food suppliers, and no other cheese will work (apart from Stracchino, which is very similar to crescenza). Great that you are going to try this Italian delicacy! I'd be interested to hear from you how it goes! Make sure that if you don't have the Ferrari oven, you have a very hot over with a baking stone. 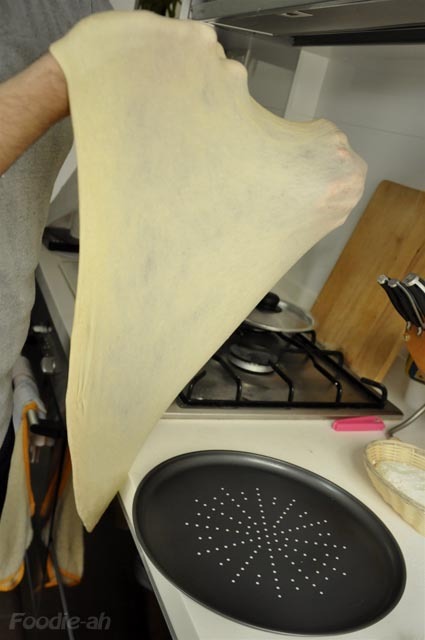 In that case, I suggest a litle trick: lay baking paper on top of the pizza tray, then lay the focaccia on top. 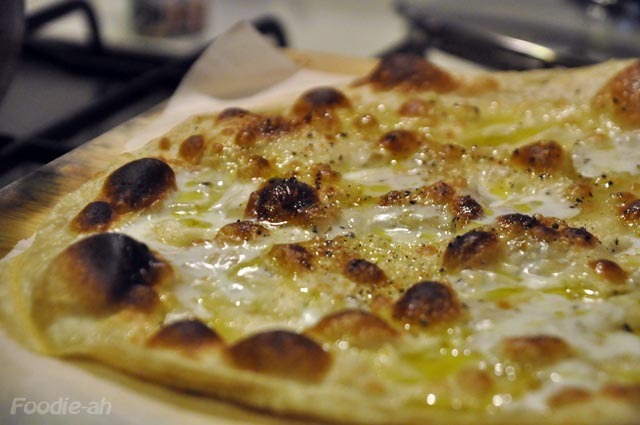 When done, don't insert the whole pizza tray in the oven, just slide in the baking paper with the focaccia on top. 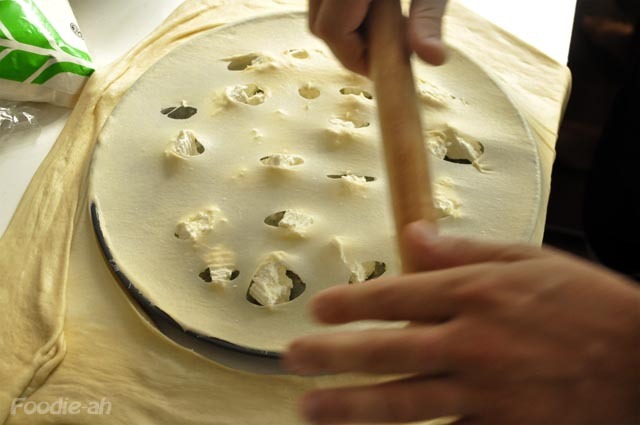 This will ensure direct contact of the focaccia with the baking stone, yielding better results. Pardon my suing your public forum for my URL. I did not see where to send a private message. Stelle barbare! Kindly pardon my spelling error - I meant to say "Pardon my using your public forum for my URL" - not "Pardon my suing"!! Thanks Adri! Your posts are always amazing and pertinent to the topics on this blog, so please feel free to put your links in my posts comments whenever you have interesting stuff such as the cavarola board. Unfortunately, G+F does not have sufficient orders to bring in the cheeses so my plans to bake this focaccia has to wait. You can self-collect so that will save the $30 delivery charge if your order isn't enough to qualify for free delivery. Thanks for the referral, and when I do get the cheese and complete the focaccia, I will let you know and share the outcomes with you. I am planning to order some large amounts later this week. if you are interested in getting a couple of pieces, send me your details and I'll order a couple of extra ones for you. Can you send me your email address so that I can get my details to you? I finally got around to doing this, and the result is deliciously awesome. I OD'ed on carb this weekend. LT - That's wonderful! I find that this crescenza is a little more solid than the usual one and it doesn't produce as much water when it melts - so I had to adjust the technique: smaller (but more in number) cubes, more evenly distributed, to ensure an even melt throughout. I am glad you made it successfully and enjoyed it!